Although the exact origins of the Yorkshire pudding are still unknown, the first recipe for ‘dripping pudding’ was published in 1737, with the prefix of ‘Yorkshire’ added some time later. Made from a simple batter of eggs, flour and milk, the Yorkshire pudding is a cornerstone of the traditional British Sunday roast. Originally it was cooked in a dripping pan placed beneath a joint of roasting meat, with the fats from the meat cooking and adding flavour to the batter below. The Yorkshire pudding has since undergone a bit of a culinary makeover, exemplified in this collection by Frances Atkins’ Mini Yorkshire puddings with meatballs. 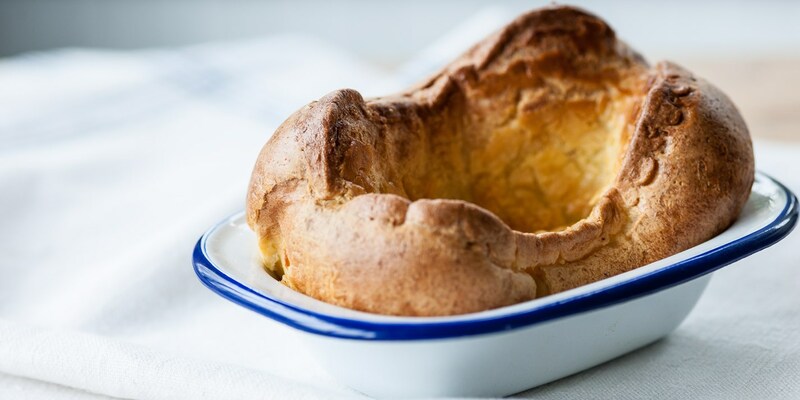 If you want a more traditional accompaniment to your Sunday lunch, look no further than Lisa Allen’s classic Yorkshire pudding recipe or the Ultimate Yorkshire Pudding by Galton Blackiston. After something meat-free? Becca Pusey shares a fantastic vegetarian recipe for Yorkshire puddings; stuffed with quinoa, cheese, spinach and mushrooms, it is a protein-rich feast.